Toastmasters Southern Africa (District 74) was well represented at the recent International Convention held in Vancouver during August. District 74 was recognised as one of the 14 President’s Distinguished Districts across the globe, having achieved this accolade for the first time in 25 years. 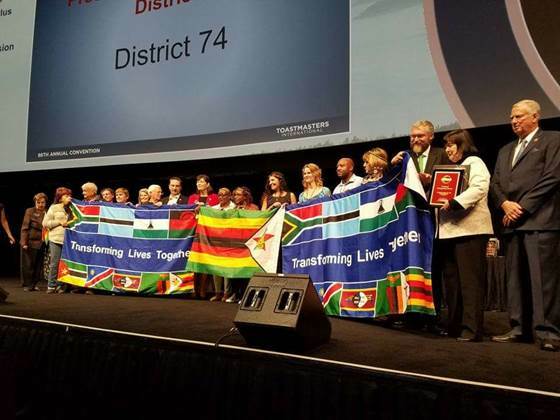 District 74 was able to extend the reach of Toastmasters to more communities during this last year, doubling the number of clubs in both Botswana and Namibia while growing clubs and membership in the rest of the District (including South Africa, Zimbabwe, Zambia, Malawi, Mozambique, Lesotho and Swaziland). Members across District also achieved personal goals in improving their communication and leadership skills, developing self-confidence in the supportive environment offered during quality club events. Lois Strachan, a past District Governor from District 74, was also acknowledged for her work in developing clubs and supporting members over many years in Southern Africa, receiving a Presidential Citation from the International President of Toastmasters International. The International Convention provided an opportunity for members to meet up with other Toastmasters from across the world, from cultures and experiences that are remarkably different but sharing the same vision and goal of building leadership and communication skills. It also provides an opportunity to appreciate excellent speakers, both in training sessions and in the semi-finals and finals of the World Championship of Public Speaking.